Chipotle Mexican Grill, Illumina, and Under Armour may be about to reverse their poor 2016 performances and deliver market-beating returns this year. 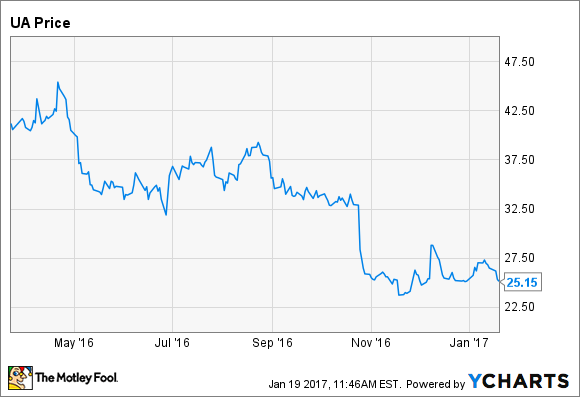 Stocks never climb (or fall) in straight lines, and while it's tempting to avoid beaten-up companies, Chipotle Mexican Grill (NYSE:CMG), Illumina (NASDAQ:ILMN), and Under Armour (NYSE:UA)(NYSE:UAA) could be bargains in 2017. Are these former high-flyers worth adding to your portfolio? Read on to learn more about the catalysts that could re-spark interest in these stocks. Following outbreaks of E. coli at some of its restaurants, Chipotle Mexican Grill became one of the most maligned stocks of 2016. However, there's evidence that the company is turning a corner, and if so, buying now when shares are 45% below where they were in 2015 might be a profitable move. Recently, management released preliminary financial results for the fourth quarter, and in doing so, it shed light on how same-store sales are progressing now that its food-borne illness troubles are fading into the past. It appears foot traffic and revenue at Chipotle's existing locations have stabilized, and given 2016's dismal sales results provide easy year-over-year comparisons this year, a rebound to growth could be in the cards. Specifically, Chipotle reported that Q4 sales clocked in at $1.035 billion, and that Q4 comparable sales were down 4.8%. Importantly, the year-over-year comparisons in comparable-store sales improved dramatically throughout the fourth quarter. In October, sales were down 20.2%, in November, they were down 1.4%, and in December, they surged 14.7%. The recovery in December's same-store sales figures stems from the fact that the company is now a more than a year beyond when the crisis first began taking a toll on sales in November and December of 2015. Because sales headwinds continued throughout 2016, there's reason to think that normalizing traffic and sales trends could provide significant year-over-year revenue tailwinds over the next four quarters. If so, then the company's earnings could improve substantially, too. In Q4, Chipotle's operating margin was between 13% and 14%, but as sales improve, leveraging revenue growth against fixed costs could help margin expand back to pre-outbreak levels of about 17%. Also, management recently announced it will repurchase another $100 million in stock, which could support share prices this year. The authorization comes on news that only $200 million remains under Chipotle's previous $2.1 billion buyback authorization. Obviously, management has been steadily buying back shares. Perhaps, you should too. Illumina investors were disappointed last year for a few reasons, which led to sharp sell-offs in the company's shares. First, the longtime CEO of the gene-sequencing pioneer, Jay Flatley, decided to hand over the day-to-day reins to successor Francis deSouza, creating a bit of uncertainty. Then, sales slipped in the first half of the year because of unexpected weakness in Europe; that was followed by a similarly unexpected drop in U.S. demand during the third quarter because of changes to lab spending. The sales hiccups caused a deceleration in year-over-year growth for the company, but it was far from a disaster. Illumina still delivered 10%-plus top line growth in the third quarter. That's pretty solid, and I think there's a chance investors will enjoy a re-acceleration of growth this year following news that Illumina is launching two new and revolutionary gene-sequencing machines. The NovaSeq 5000 and 6000 can sequence genomes faster and more accurately than ever before, which could be particularly useful as more money gets spent developing personalized medicine. Furthermore, management thinks these machines could eventually reduce the cost of sequencing a genome from $1,000 to as little as $100. If so, then their launch lead to a surge in gene sequencing that drives demand for the high-margin consumables used by these machines. In the past, reductions in the cost of gene sequencing have led to significant increases in demand that have fueled sales and profitability. Although there's no guarantee that these machines will create a similar bump for Illumina this time around, I think there's a very good chance that we'll be using genetic research far more in the future than we do today. If I'm correct, then this could be an excellent time to stash away some Illumina shares in your portfolio. Under Armour struggled last year under the weight of inventory disruptions tied to the bankruptcy of one of its biggest retailers, and its shares have essentially gone nowhere but down. 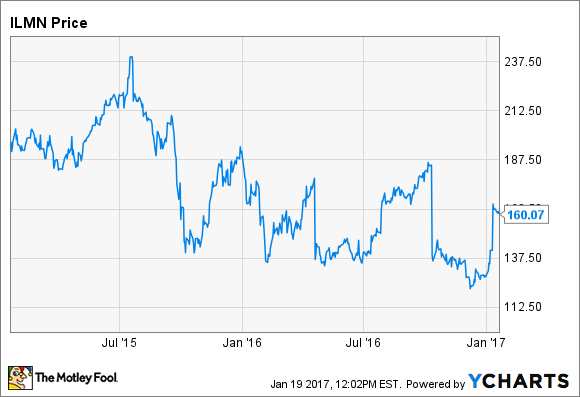 Under Armour's share price decline, however, may be about over. Though headwinds tied to Sports Authority's demise dragged on Under Armour's margins last year, they provide easier earnings comparisons for 2017. Further, while management has revised its guidance downward from its 2015 forecast of $800 million in operating income by 2018, the company still remains highly profitable, with over $431 million in operating income over the past 12 months, and a potential to deliver $650 million to $700 million in operating earnings in 2018. Granted, the guidance cut isn't a short-term plus, but it was made in part due to management's decision to double down on investments in the business. If those investments lead to innovation, market share gains, and cost savings, then the short-term pain could be more than offset by long-term opportunities for gain. It also shouldn't be ignored that while Under Armour's been dealing with challenges, it's still a growing business. For example, its sales and operating income grew 22% and 16% from a year ago in the third quarter. Given the company's track record, and the fact that shares can be bought at a significant discount to where they were a year ago, they could deliver up-sized returns in 2017 that make them worth owning.